Handsome family home - upgraded, well maintained, spacious and full of character! Charming hardwood floors and beautiful wood trim throughout. Gourmet kitchen overlooks the rare main floor family room! Ideal for entertaining! Main floor addition includes gas fireplace, skylights and walk out to gorgeous yard. 15 foot Cathedral ceiling in master bedrooom! Fully finished lower level recreation/play room features a 3 pc bath and ample storage. The deep rear yard has been landscaped to perfection! Mature gardens in front and back. 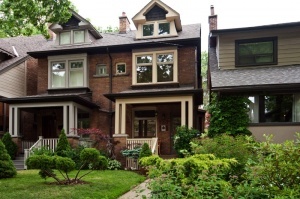 5 minute walk to the heart of Bloor West Village. You will thrive on this wonderful family friendly street! Best Block North of Bloor! Superb location half a block to Bloor. Far enough away from the hustle and bustle of Bloor Street yet close enough to be beyond convenient. Shopping could not get any better! Steps from the Village shopping district with its many specialty shops,fruit markets, European delis/bakeries, delicious restaurants, book stores, banks and more. No need to drive anywhere! Walk for all your grocery shopping. Many young and new families line the street. Nearly every home is a couple expecting or with young children. Excellent school district! Walk to Public, French Immersion & Catholic schools (St. Pius). Enjoy the advantage of being in the Runnymede Jr & Sr Public School and Humberside Collegiate school catchment area. Nearby neighbourhood parks, easy access to the Humber River paths and of course High Park, the jewel of the Toronto Parks system. Well served by the TTC. Runnymede station is 2 blocks west and Jane Subway station is just over 3 blocks east. Motorists enjoy the convenience of being located only minutes away from the Gardiner Expressway, Lake Shore Blvd. QEW and the Airport! Welcome to 305 Durie Street! The ideal home for young families or professional couples who love to entertain! This is a special opportunity to own a spacious, renovated semi in the heart of one of the city’s friendliest neighbourhoods! Very pretty curb appeal, perfectly manicured front lawn with welcoming covered porch. Hardwood floors throughout the main floor with exposed natural wood trim. Formal living and dining for “grown up” parties. Cook's kitchen overlooks family room. Granite breakfast bar is perfect for casual meals and a great spot for children's meal time/homework. Everyone will want to hang out in the cozy main floor family room with gas fireplace. A skylight floods the room with natural light. Wall to wall French doors provide a stellar view of the beautiful back deck and gardens and truly expands the usable living space! Great flow for partying inside or out! The spacious master bedroom features 15’ cathedral ceiling with endless natural light and a beautiful view of the trees via the 2 large windows. A wall to wall closet provides ample storage space. The 2nd bedroom which looks out over the garden has a double closet and beautiful hardwood floors. The 3rd bedroom, also a good size, has a lovely stained glass window. Modern family bath serves this level. The lower level opens into a professionally finished recreation room - great home office space - great for kids - great for surround sound and home theatre system! Renovated 3 piece bath including glass block shower plus separate storage room and a large laundry/utility room. The fully fenced private yard includes a huge deck, as well as a lush perennial garden. Adorable wood garden shed. Feels like a secluded oasis.